There's also the option every other person that was new to social media kept asking for, back when social media was still new. How can I make it available to everyone EXCEPT HIM/HER!? A watermelon is best cut with a knife and eaten with a spoon, not the other way around. Sableagle wrote: This map is no help at all in determining whether I should move to Ste Enimie... or Sabugueiro. Indeed. Perhaps a web-based city/place lookup should do. I made a world map based on a possible interpretation of the categories used in this comic. Finally, a decent sequel to Hitchcock's “The Birds”. I prefer the quantitative (though still subjective...) Scoville scale (for Heat) and the 2-dimensional Pick-a-Mood scale (for Mood). speising wrote: This misses a rather important feature of the original. As you wish, if you wanna follow the letter of the law instead of the spirit of the law. ... And I was wrong about that last one. 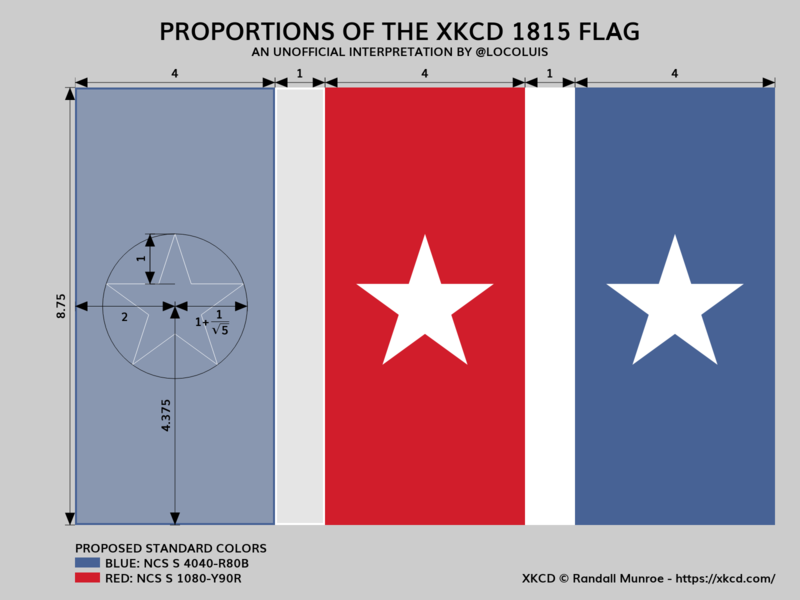 The stars ARE centered in each field, but the flag's proportion is 8:5, not 14:9. Don't let it happen to you what happened to Patricia last year! There is at least one programming language where applying a patch with Photoshop makes sense. ... who am I kidding. Too obvious. joeyadams wrote: HyperCard.js sounds awesome. Who wants to help make that a reality? Some people already tried, long ago. There's a reason why we can't have nice things. By February 1, 2016, I expect to post a comic depicting events dated at "February 1, 1996". Tartar sauce is a surprisingly good dressing for potato salads, fried potatoes, etc. But NOT for mashed potatoes. That was an horrible idea. StClair wrote: That feeling when you realize that nothing you have ever posted, or ever will, is actually interesting or valuable enough - to anyone - to bother encrypting. ... or that most of us aren't influential enough for anyone to bother impersonating us.